Looking for the best Birding trails around Redlands? Find the top rated birding trails in Redlands, whether you're looking for an easy short birding trail or a long birding trail, you'll find what you're looking for. Click on a birding trail below to find trail descriptions, trail maps, photos, and reviews. Love this trail. I cycle this trail regularly; at least 3-4 times per week. I often ride this trail from Fruita into Grand Junction (Eagle Rim Park) and back. The first couple miles from Fruita are a bit boring as it is a straight shot and parallel to I-70 but after that it gets more interesting. Today lots of bikers and walkers, plenty of room for everyone. The section from Fruita into Grand Junction is the newest portion and the trail is nice wide concrete. The older section of trail is narrower and some asphalt. Still a nice ride. Many of the underpass sections have some nice art work on them. A few weeks ago a bobcat ran across the trail only a few feet in front of me. Another section of trail is being built going from Fruita west, I believe it will then connect to the Kokopelli Trailhead near Loma. A nice and pleasant, flat ride especially if you keep your focus toward the river and not the usual urbanization or industrial influences or highway hijinks in the opposite view direction. Brief sections have less intrusive stuff and more natural beauty than others. Only climb of note is the short easy one to Eagle Rim Park where you can take a lap and do some tricks in the nice bike park there. There is a very good overlook of the entire Grand Junction valley there too. There is some great public art, "graffiti-like", along the way too. This area of Colorado can be exceptionally hot in the summer. But that means it can be really pleasant in the cooler months and very ride-able on nice winter days. Given the abundance of vegetation along the river course (lots of big Cottonwood trees), it would be spectacular in fall when the leaves are changing. Spring would nice too with it all greened out and likely lots of birds. Judging from the other reviews, I don't think I rode the most scenic part of this trail in my out and back. One one hand, there are a few nice stretches along the river, but there is quite a bit of the trail that's close to the busy highway. The paved trail is in good shape and the ride is easy. Looking forward to the new rest area, peach groves, shaded benches, not to mention a great view. Located near the new RV campgrounds. 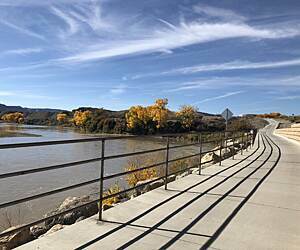 A nice ride or hike from Junction to Palisade. We started the ride at Los Colonias Park next to the botanical gardens. There is parking, water, restroom, and a shaded gazebo with picnic tables here. We headed towards Fruita cycling the recently-completed Monument View Trail to the Blue Heron trail to the Colorado Visitor Center in Fruita. The condition of this trail varied depending on the section. The trail starts out nice and smooth at about 12 feet wide from Los Colonias Park. It then narrows to about 8 feet with lots of roots and cracks in the pavement until you reach the new section called Monument View near the Blue Heron Boat Launch. Then, it is smooth and wide to the Fruita visitor center. At some points, the path is curvy and runs along the river. At other points, it is flat and runs parallel to the road. The description in this website doesn’t always match the reality of the path. Yes, at some points you do have nice views of the surrounding mesa and the river. However, the description fails to mention that if you start your ride at Los Colonias park near downtown Grand Junction, you will be cycling through industrials areas. Some of your view will be that of junk yards, gravel pits, storage yards, trucking company parking lots and other industrial-type businesses. So, unless you are wearing blinders, it isn’t as pretty as described. If you want pretty all the way, park at the Blue Heron Boat Launch and head out from there. There are benches along the path but most of them are not strategically placed. Most are in full sun and many are placed at weird places like across from an industrial site or, if along the river, right in front of a tree which blocks the view of the river. However, overall, we enjoyed the ride and would recommend it. Water was available only at the beginning at Los Colonias Park and at the end of our ride at the visitor center. Our roundtrip mileage was about 28 miles with a couple of detours. This review is for an out-and-back ride. We cycled from downtown Grand Junction down 7th Street for one mile to the start of the trail at Los Colonias Park which is next to the botanical gardens. Parking, water, restroom, and a shaded gazebo with picnic tables are available here. We headed in the direction of Palisade. Heading in this direction, there is a gap in the trail after about 2.4 miles. You will cycle on C ½ Road for about 0.9 miles before turning right at the end onto 29 Road for a half mile to connect back up to the trail. C ½ Road is lightly traveled; 29 Road is a bit busier but there is a bike lane and a wide sidewalk. Throughout the ride, the bike path was in excellent condition and very wide. However, additional signage is needed especially at the Corn Lake section of the Colorado State Park. Since we are not from the area, if we hadn’t read about the bike path continuing at an underpass under the highway, we would have simply not continued on. For the most part, the bike path is away from streets and traffic and feels remote (when really it isn’t). The ride had a country-like feel to it. The bike path ended abruptly at a county rode. A passing cyclist told us that we would need to cycle the road to get to the town of Palisade. We turned around at this point. Excellent trail over 15 miles. You can ride all the way to Fruita. You can catch the trail at the botanical gardens and several other places with no parking fees. The starting place on the map charges for parking.